15854XD-16 - COMP Cams Hydraulic Lifters - Short Travel XD - Pann Auto Performance - San Diego largest aftermarket automotive performance parts - What do you drive? Certain engines respond better to a light lifter pre-load because it recovers more quickly from any bad harmonics in the valve train. Others work better with a heavy pre-load because oil volume is reduced under the plunger, which increases lifter stiffness. 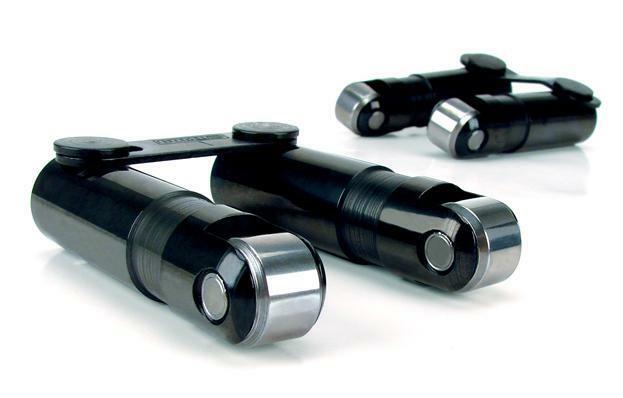 COMP Cams Short Travel Hydraulic Roller Lifters let you have the advantages of both light pre-load and reduced oil volume, producing the most stable and highest-revving hydraulic lifter available. COMP® now offers an XD version of these lifters that features a heavy-duty tool steel pushrod seat. This adds strength and durability in Xtreme Duty applications such as turbo drag cars and offshore powerboats. The lifters are available for a variety of Chevrolet, GM LS and Chrysler engines.